Handi-Move lift and care systems specialize in a wide range of solutions that facilitate independence and ease of movement for people with disabilities. According to the World Health Organization, more than 10% of people with disabilities require a wheelchair for personal mobility. For these people, a wheelchair is a precondition for enjoying human rights and living with dignity. The wheelchair is, no doubt, a highly useful mobility tool. However, people on a wheelchair still require extensive assistance whenever they need to lift themselves from their mobility device. 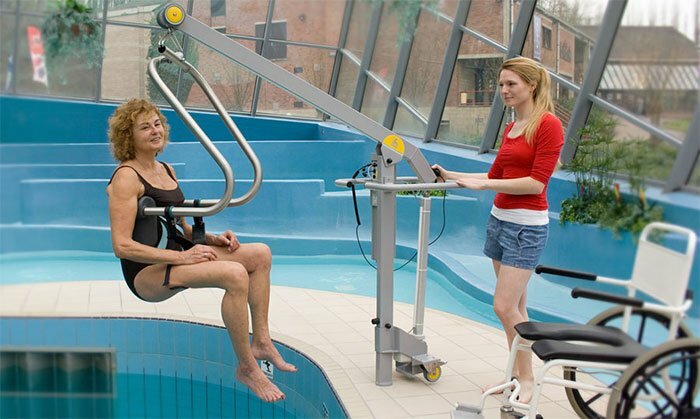 Handi-Move lift and care systems specialize in a wide range of solutions that further facilitate independence and ease of movement for people with disabilities. Handi-move employs a continuous ceiling track and a motor that ease the movement of users between rooms. With Handi-Move Body Support or Seat Sling, people with disabilities can move independently from a wheelchair directly into a tub. Depending on the individuals’ abilities, a system that lifts them from the wheelchair into the toilet and the bed can also be designed. Such systems make them even more independent and reduce the burden on their caregivers. Sometimes, a disability may affect an individual’s hands and make them unable to perform routine tasks such as bathing. Such persons would need a caregiver for virtually every task. In addition, sometimes more than one person would be needed to lift them. With Handi-move, the task of the caregiver would be significantly simplified such that they would not need to exert any power while lifting their wards. All you need to do is install a Handi-Move ceiling lift, mobile lift, wall lift, or stand assist. All these devices come with a control device that can be easily operated by the attendant. The attendant can help them get in and out of bed, into and out of the toilet seat or bathtub, and virtually any other place where they need to be lifted off the wheelchair. It is recommended that all Handi-Move lifts are used with a Handi-Move Body Support or Sling to ensure the safety of the user. The support or sling serves to fasten the user to the device during the lifting process, minimizing the risk of a fall or any other accident. Handi-Move Lift and Care systems are known for customizing their solutions to fit the needs of their clients. If you need a Handi-Move system in your home, a representative from the company would work with you to design a system that suits your needs perfectly. You can visit the official Handi-Move website for more information.